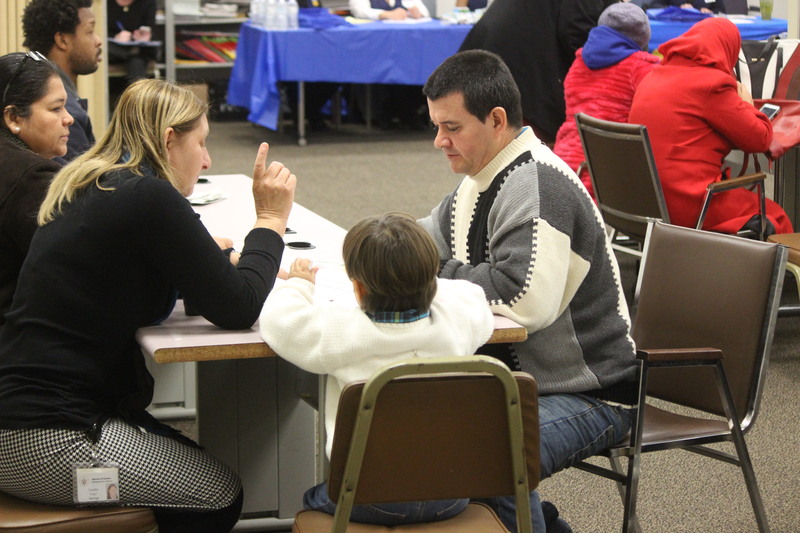 Lucy Santiago, a Catholic Charities case worker for the Refugee and Immigration program, assists a job-seeker with an application during the agency’s 2017 job fair. A torrential downpour didn’t stop 40 eager job-seekers from attending Catholic Charities’ 2017 Job Fair on Jan. 17. The lobby was full by 9 a.m. — one hour before the start of the job fair. Some attendees were referred by Catholic Charities’ case managers from the agency’s Welfare to Work program. Many were a part of the Veterans Assistance program. Some were refugees. Others had heard about the fair through word-of-mouth. All had one thing in common: to get to work as soon as possible. “A lot of them say, ‘I want to find a job, but I don’t even know where to start.’ Or ‘I don’t know where to go.’ Or, ‘I don’t know who’s going to hire me,’” said Moustafa Aldouri, one of the organizers of the fair. “This is sort of a one-stop, come on through the door, and you’re going to meet people that are wanting to hire you,” he explained. In addition to Catholic Charities clients, the job fair catered to others with significant barriers to employment such as those with a poor job history, lack of education or training, criminal records or difficulties with mental illness or substance abuse. Vendors such as Wal-Mart, Accu-Staffing and Weston Hotel set up their tables, while Catholic Charities staff welcomed job seekers and helped them prepare for the event. Rita Colton never envisioned herself needing to seek work at a job fair. “I’ve had a steady full-time job for most of my life. But when my husband got sick, I stopped working to take care of him for the past three years,” she said, “and many employers are turned off by the fact that I haven’t been to work for such a long time. That’s why I’m here. And knowing that there are employers here that want to hire people like me is so relieving,” she added. 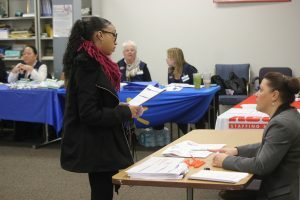 Between 10 a.m. and 2 p.m., applicants flocked to the various employer tables, filled out job applications, gathered information about potential positions, and inquired about work hours. For many, the difficulty for finding a job goes beyond the search itself. There are logistical hurdles to be overcome, such as lacking reliable transportation or appropriate business clothes for interviews. 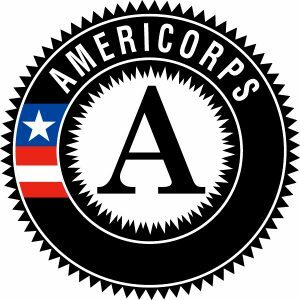 The Catholic Charities staff assist people with these challenges, as well as provide help with resume-writing and interview tips. Job seekers left the office with folders of paperwork, smiles, and a new sense of hope.